As a student in Vienna during the 1971-1972 academic year, I was always looking for ways to save money. Fortunately, Austrians made it possible for students to live cheaply with subsidized eateries (Mensa); cheap student lodging (Studentenheim); reduced prices for museums, plays, opera and concerts; and reduced fares on public transportation. For most of these discounts, all you needed was proof that you were a university student. In addition, other bargains, available to everyone, were to be found, including the incredibly cheap "standing room" places for even the best music and dance events. With plenty of time to stand in line, I got excellent standing spots to hear the Wiener Philharmonic, observe Leonard Bernstein conduct Mahler symphonies, and watch Nureyev dance. With an eye out for such bargains, I was pleased to hear that I could get discounts on train travel if I belonged to a organized travel group. So, one day I was walking near my apartment in the Eighth District and noticed a sign for the Ősterreichischer Alpenverein (ŐAV), the Austrian Alpine Club. I decided to sign up, figuring the dues would quickly be exceeded by savings on travel using the Austrian national railways. 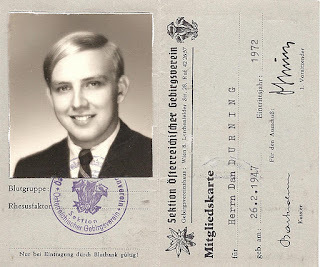 Later that day, when I mentioned that I had joined the Ősterreichischer Alpenverein to my friend Jörg Wollmann, a Viennese who was a few years older than me, he gave me a funny look, shook his head, and said something like, "Don't you know that is a brown group." Well, I didn't know, and I was not sure what he meant. However, I was quite aware of the deep political divisions in Austrian society that had created, from the beginnings of the First Republic after WWI, what political scientists had called "Lager," roughly translated as "political camps," into which most people were born and stayed their whole lives. The two main political camps were the socialists (or social democrats) and the Catholic-conservatives. Membership in the camps was, to a large extent, a matter of geography: most members were grouped together based on where they lived. For example, a large majority of Viennese (excluding those living in a few districts) were solidly members of the socialist camp, while most rural and small city Austrians were members of the Catholic-conservative camp. In industrial cities, the socialists lived in worker's districts, and the Catholic-conservatives lived elsewhere. Also, occupation played a large role in determining to which political camp you belonged. Most laborers ("workers") were in the socialist camp, and most shop owners, farmers, and managers were Catholic conservatives. After WWII, the two camps were roughly equal in size, each about 45 percent of the population. The people comprising the other ten percent of the population were independent or were members of smaller political camps, including a German nationalist group and a communist group. The first group was on the far right, and it attracted, some said, people with Nazi sympathies. It typically struggled to get the five percent of the vote needed to be represented in the national parliament. The communist group usually received less than two percent of the vote nationally. Being a part of a political camp meant much more than supporting a political party. It also meant that you associated mainly with others of your camp. You lived next to them, went to school with them, went (or didn't go) to church with them, read the same newspapers and magazines, were members of the same social clubs, and were members of the same unions or employer groups or industry associations. In short, you spent your time mostly with people in your political camp from cradle to grave. These lager were at odds over many basic issues, economic, social, and religious. The divisions and enmity were so great during the 1920s and 1930s that each created their own militias, and in 1934, the Catholic-conservative militia (Heimwehr) teamed with the Austrian army (commanded by Dollfuss, the Catholic-conservative Chancellor) to crush the social democrats in a brief and decisive civil war. Out of the ruins of the 1938 Anschluss and World War II, Austrians found ways to build bridges between the two camps so that future armed strife could be avoided. The mechanisms for managing conflict included a Grand Coalition of the two main political camps that governed the country for decades after the end of the war, plus other mechanisms to insure that the two camps shared power, influence, and positions. Essentially, each political camp had a veto power over government action to address major national issues. In 1971 and 1972, the political camps still dominated politics, but were weakening. In 1971, Bruno Kreisky's Socialist Party (SPŐ) received 50 percent of the vote in Parliamentary elections, winning a majority of the seats in Parliament. For the first time since WWII, one party governed Austria without a coalition. In that election, the German nationalist party, the Freiheitliche Partei Österreichs (FPŐ) received 5.5 percent of the vote, winning 10 seats in the 183-seat Parliament. Its fortunes would improve in coming decades, but in 1971 it still was a fringe party with a suspicious membership, winning support mainly from rural parts of the country. 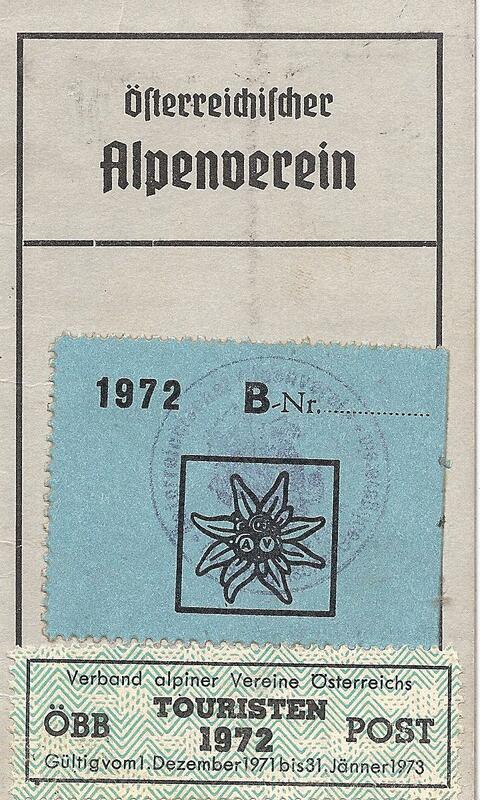 It was within this 1971-72 political framework that I had meandered unknowingly into a tacit affiliation with the far right political camp by becoming a member of the Ősterreichischer Alpenverein. What I had not known is that ŐAV, the oldest mountain climbing and hiking group in Austria, had an unsavory history. The club was created in 1862 as an organization for mountain climbers and hikers, and its first sixty years were benevolent: it helped develop trails and built mountain huts in the Alps. But soon after WWI, it entered politics when -- merged with the German Alpine Club (DAV) -- it became a promoter of the "German way of life" and developed anti-Semitic policies. In 1924, it allowed its different sections to prohibit Jews from being members, which most did. After the Anschluss, the ŐAV continued to function as a Nazi-sanctioned organization within the Austrian Gau. The ŐAV, now the largest travel group in Austria, acknowledges the unsavory elements of its history (see this web site: http://bit.ly/nzXmvz ). As part of the upcoming celebration of the 150th anniversary of its founding, it is publishing a book that critically examines its history from 1918 to 1945. The book is entitled Berg Heil! 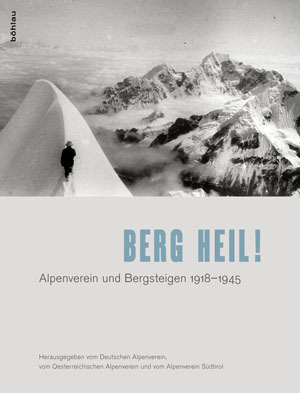 Alpenverein und Bergsteigen 1918-1945. 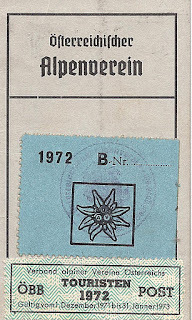 Despite its present popularity, in 1972, at least some people, including Jörg, viewed the ŐAV, based on its history, as a "brown" (Nazi-associated) or "blue" (FPŐ-associated) club. People who were strongly anti-Nazi and/or were members of other political camps (the reds and blacks) were unlikely to join it. People who had brown sympathies and/or were members of the German national political camp were more likely to be members of this travel and mountain climbing club than any other one. I discovered that other travel and mountain climbing clubs existed for members of the main political camps. If you were a member of the SPŐ ("red") camp, you would likely join Die Naturfreunde Ősterreichs (the Friends of Nature of Austria), created in 1895 to assist workers to enjoy travel and nature. As a member of the Catholic conservative ("black") camp, with the Ősterreichische Volkspartei (ŐVP) at its center, you would likely join the Ősterreichische Touristenverein (ŐTV), the Austrian Tourist Club, founded in 1908 and affiliated then with the Christian Socialist Party. When I figured out that I had joined a group that some people considered "brown" or "blue," I was chagrined. I had simply wanted a discount on rail travel and had stopped by the office of the nearest travel organization that would get me that discount. By joining this Club, inadvertently aligning myself with repugnant political views, I learned a lesson about how simple private acts in Austria could convey a regrettable political message.